CablesAndKits has always had a heart for giving to others. Serving others is at the core of our being, as we positively impact others. We act with an “I’m for you” mentality and perpetually seek ways to assist others. As we prepare to upgrade our technology internally, a silent auction was held in efforts to raise money to bless Rainbow Village, a local non-profit organization. All of our employees were given the opportunity to place their bid on technology that was being phased out and 100% of the profits were donated. Navigate Recovery is Gwinnett’s only recovery community organization dedicated to changing the way addiction is treated in Gwinnett County, Georgia. This organization acts as a clearinghouse for services and opens the lines of communication to provide better outcomes for addiction sufferers and their families. 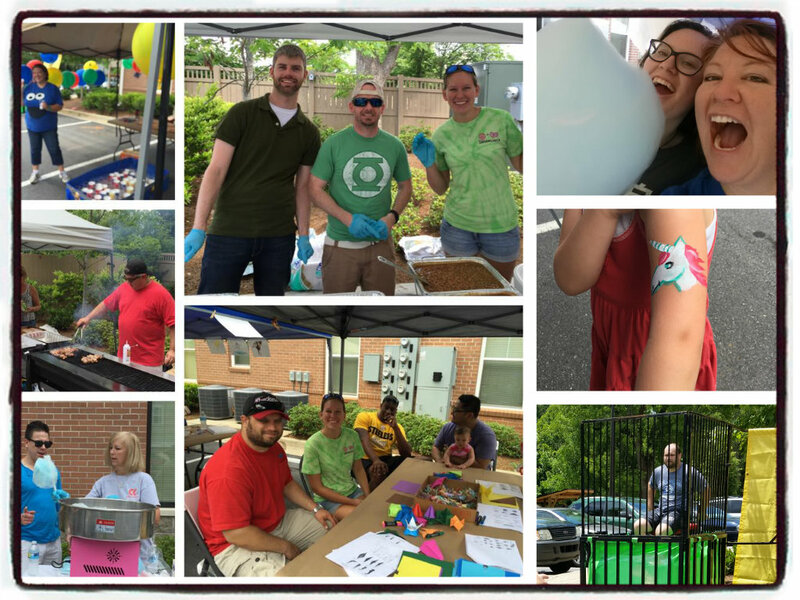 At CablesAndKits, one of our core values is to Serve Others and what better way to do that than to support an organization like Navigate Recovery Gwinnett. This past weekend, CablesAndKits supported Navigate Recovery Gwinnett in taking part in their 5K Run/Walk. This event was created to support and celebrate those who are on the road to rehabilitation and to show others recovery is possible! Last weekend, CablesAndKits hosted the 3rd Annual Family Fun Day supporting Rainbow Village, a transitional housing community for homeless families with children. Serving Others is a core value that CablesAndKits employees incorporate in their daily lives. The “I’m for you” mentality as well as perpetually seeking ways to assist others embodies the Serve Others mantra. CablesAndKits provided a circus-themed fun day that included a delicious BBQ meal, a face-painting clown, and a cake walk. Parents and children of all ages participated in the various activities along with our employees’ children. The day was filled with activities such as making origami animals, a ring toss, and they even had the opportunity to test their strength on the high strike. The main event, however, was the infamous dunk booth, where the fiancé of one of our Customer Support Specialists took a chance with the collapsing seat as the children of Rainbow Village tried their hand at throwing the ball at the target. We are so thankful for the opportunity to bless these children and their families with a day of fun. 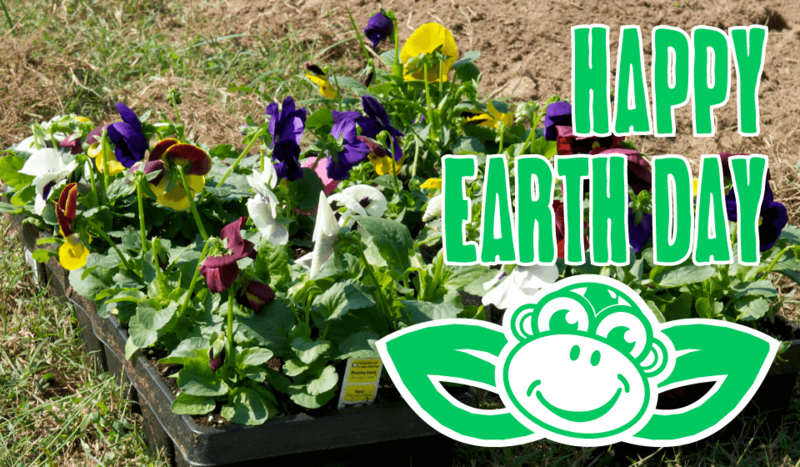 April 22, 2015 marks the 25th anniversary of Earth Day, a day we celebrate the birth of the modern environmental movement. Today we celebrate Mother Nature and highlight the different ways we can help save the planet in our daily lives while working for any tech-savvy company. Computers should be turned off at the close of business and on weekends to save energy. According to IBM, by telling their employees to turn off their computers for at least one hour each day, can save the company $1 million per year in energy cost. Using recycled paper not only saves trees but it also helps to save energy, water and landfill paper. The recycled paper produces less pollution that is essential for a healthy environment. In efforts to save trees, double side printing will be a great start. By using half the amount of printing paper, you will in turn save some money while being eco-friendly. The cloud is a network of servers that can store all your saved documents and data with accessibility from anywhere. The cloud gives you the capability to share documents with coworkers without having to print. Using the cloud gives you the opportunity to save energy and the earth by reducing the need to print documents. Brands such as Cisco provide a program named EnergyWise on their products that measure and control energy between the network devices and endpoints. Company’s such as CablesAndKits offer products that are energy efficient to helpful in more than the intended reason. Laptops use less power than a desktop. Most desktops consume between 70 and 200 watts while in use, while laptops use between 15 and 60 watts. Laptops tend to use less electricity than a desktop in turns uses less energy. Many times we overlook the one thing that can be a huge energy drain- our computers. Let’s help out our beautiful world and make a difference! We act with an “I’m for you” mentality and perpetually seek ways to assist others. We collaborate with humility and appreciation to positively impact our team, our customers, our vendors, and others within our sphere of influence. 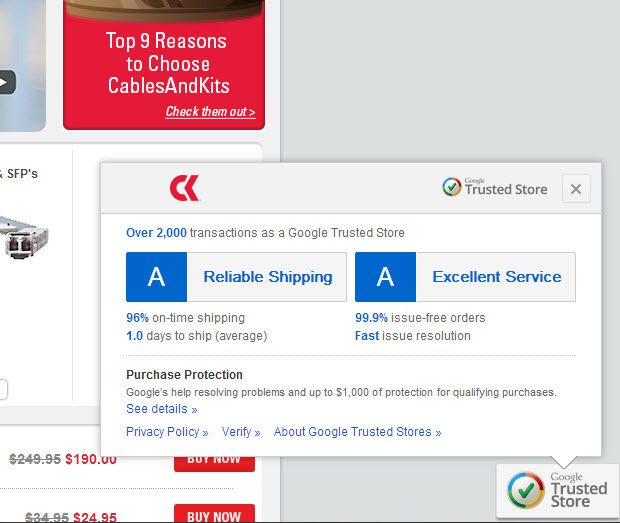 CablesAndKits is excited to announce that they are now part of the Google Trusted Stores Program! The positive shopping experience at CablesAndKits is being recognized via inclusion in the Google Trusted Stores Program. With the Google Trusted Store badge, this pre-owned Cisco equipment seller will be able to show potential customers their proven track record of on-time shipping and excellent customer service. Google Trusted Stores is a badge for an e-commerce site which gives users background on merchants — whatever their size — including ratings for on-time shipping and customer service.